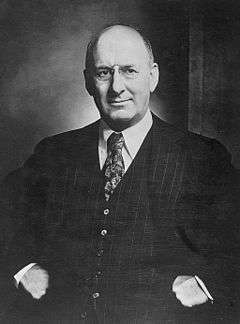 Henry Morgenthau Jr. (/ˈmɔːrɡənθɔː/; May 11, 1891 – February 6, 1967) was the U.S. Secretary of the Treasury during the administration of Franklin D. Roosevelt. He played a major role in designing and financing the New Deal. After 1937, while still in charge of the Treasury, he played the central role in financing US participation in World War II. He also played an increasingly major role in shaping foreign policy, especially with respect to Lend Lease, support for China, helping Jewish refugees, and proposing (in the "Morgenthau Plan") to prevent Germany from again being a military threat by wrecking its industry and mines. Morgenthau was the father of Robert M. Morgenthau, who was District Attorney of Manhattan for 35 years. Morgenthau was born into a prominent Jewish family in New York City, the son of Henry Morgenthau, Sr., a real estate mogul and diplomat, and Josephine Sykes. He had three sisters. He attended the Dwight School, then studied architecture and agriculture at Cornell University. In 1913, he met and became friends with Franklin and Eleanor Roosevelt. He operated a farm named Fishkill Farms near the Roosevelt estate in upstate New York, specializing, like FDR, in growing Christmas trees. He was concerned about distress among farmers, who comprised over a fourth of the population. In 1922 he took over the American Agriculturalist magazine, making it a voice for reclamation, conservation, and scientific farming. In 1929, Roosevelt, as Governor of New York, appointed him chair of the New York State Agricultural Advisory Committee and to the state Conservation Commission. Saturday - Went to the White House and met Jones there. I said to the President that we did not buy any gold last night. He said, "That is right. Harrison called up and spoke to Jesse." I could not make out whether he also spoke to the President. Then Harrison urged that inasmuch as Saturday was only half a day that they should not buy any gold. Both the President and Jones said that they thought they made a mistake by agreeing with Harrison. I believe it was on Friday that we raised the price 21¢, and the President said, "It is a lucky number because it is three times seven." If anybody ever knew how we really set the gold price through a combination of lucky numbers, etc., I think that they really would be frightened. Saturday we increased the price 10¢. I stayed after Jones left and had a good half hour talk in which most of the time Louis Howe was present. In 1934, when William H. Woodin resigned because of poor health, Roosevelt appointed Morgenthau Secretary of the Treasury; even conservatives approved. Morgenthau was an orthodox economist who opposed Keynesian economics and disapproved of some elements of Roosevelt's New Deal. To finance World War II, he initiated an elaborate system of marketing war bonds. 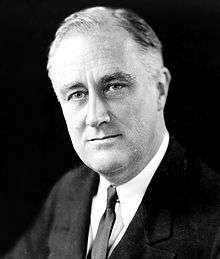 To protect the New Deal, in 1934, President Franklin D. Roosevelt asked Morgenthau to examine the taxes of William Randolph Hearst because FDR was "advised that Hearst was planning to use his newspapers to launch a major attack on the New Deal and its economic policies." Treasury Secretary Morgenthau explained that he examined the taxes of William Randolph Hearst and actress Marion Davies and "advised FDR to mount a preemptive attack on both her and Hearst." Morgenthau used his position as Treasury chief to investigate organized crime and government corruption. Treasury Intelligence and other agencies (the notoriously fragmented US federal law enforcement system had five in the Treasury Department alone) were uncoordinated in their efforts; efforts to create a super-agency were stalled by J. Edgar Hoover, who feared his FBI would be overshadowed. 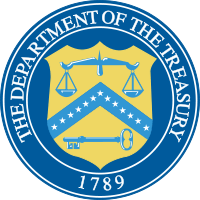 Nevertheless, Morgenthau created a coordinator for the Treasury agencies; although the coordinator could not control them, he could move them to some cooperation. We want to see private business expand. … We believe that one of the most important ways of achieving these ends at this time is to continue progress toward a balance of the federal budget. We have tried spending money. We are spending more than we have ever spent before and it does not work. And I have just one interest, and if I am wrong … somebody else can have my job. I want to see this country prosperous. I want to see people get a job. I want to see people get enough to eat. We have never made good on our promises. … I say after eight years of this Administration we have just as much unemployment as when we started. … And an enormous debt to boot. We have never begun to tax the people in this country the way they should be..... I don't pay what I should. People in my class don't. People who have it should pay. Once confronted by the Holocaust, the Allied Powers reacted slowly. In 1943, Morgenthau's Treasury Department approved the World Jewish Congress' plan to rescue Jews through the use of blocked accounts in Switzerland, but the State Department and the British Foreign Office procrastinated further. Morgenthau and his staff persisted in bypassing State and ultimately confronting Roosevelt in January 1944. He obtained the presidential creation of the US War Refugee Board in January 1944. The Board sponsored the Raoul Wallenberg mission to Budapest and allowed an increasing number of Jews to enter the U.S. in 1944 and 1945; as many as 200,000 Jews were saved in this way. Hurwitz (1991) argues that in late 1943, the Treasury Department drafted a report calling for the creation of a special rescue agency for European Jewry. At the same time, several congressmen connected with the "Bergson Boys" introduced a resolution also calling for the creation of such an agency. 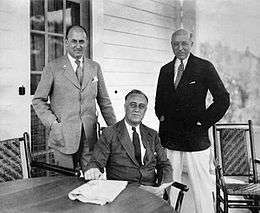 On January 16, 1944, Morgenthau presented Roosevelt with the Treasury report, and the president agreed to create the War Refugee Board (WRB), the first major attempt of the United States to deal with the annihilation of European Jews. In 1944, Morgenthau proposed the Morgenthau Plan for postwar Germany, calling for Germany to lose the heavy industry, and the Ruhr "should not only be stripped of all presently existing industries but so weakened and controlled that it can not in the foreseeable future become an industrial area". Germany would keep its rich farmlands in the east. However Stalin insisted on the Oder-Neisse border, which moved those farming areas out of Germany. Therefore, the original Morgenthau plan had to be dropped, Weinberg argues, because it was "too soft on the Germans, not too hard as some still imagine." At the Second Quebec Conference on September 16, 1944, Roosevelt and Morgenthau persuaded the initially very reluctant British Prime Minister Winston Churchill to agree to the Morgenthau plan, likely using a $6 billion Lend Lease agreement to do so. Churchill chose however to narrow the scope of Morgenthau's proposal by drafting a new version of the memorandum, which ended up being the version signed by the two statesmen. The gist of the signed memorandum was "This programme for eliminating the war-making industries in the Ruhr and the Saar is looking forward to converting Germany into a country primarily agricultural and pastoral in its character." German Propaganda Minister Joseph Goebbels used the leaked plan, with some success, to encourage the German people to persevere in their war efforts so that their country would not be turned into a "potato field." General George Marshall complained to Morgenthau that German resistance had strengthened. Hoping to get Morgenthau to relent on his plan for Germany, Roosevelt's son-in-law, Lt. Colonel John Boettiger, who worked in the United States War Department, explained to Morgenthau how the American troops that had had to fight for five weeks against fierce German resistance to capture Aachen and complained to him that the Morgenthau Plan was "worth thirty divisions to the Germans." In late 1944, Roosevelt's election opponent, Thomas Dewey, said it was worth "ten divisions". Morgenthau refused to relent. 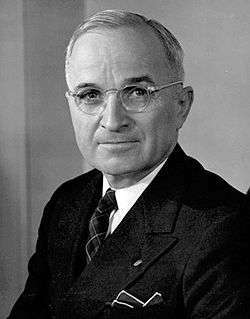 On May 10, 1945, Truman signed the U.S. occupation directive JCS 1067. Morgenthau told his staff that it was a big day for the Treasury, and that he hoped that "someone doesn't recognize it as the Morgenthau Plan." The directive, which was in effect for over two years directed the U.S. forces of occupation to "...take no steps looking toward the economic rehabilitation of Germany". In occupied Germany Morgenthau left a direct legacy through what in OMGUS commonly were called "Morgenthau boys". These were U.S. Treasury officials whom General Dwight D. Eisenhower had "loaned" in to the Army of occupation. These people ensured that JCS 1067 was interpreted as strictly as possible. They were most active in the first crucial months of the occupation, but continued their activities for almost two years following the resignations of Morgenthau in mid-1945, and some time later, of their leader, Colonel Bernard Bernstein, who was "the repository of the Morgenthau spirit in the army of occupation". They resigned when, in July 1947, JCS 1067 was replaced by JCS 1779 which instead stressed that "An orderly, prosperous Europe requires the economic contributions of a stable and productive Germany." In October 1945, Morgenthau published a book titled Germany is Our Problem in which he described and motivated the Morgenthau plan in great detail. Roosevelt had granted permission for the book the evening before his death, when dining with Morgenthau at Warm Springs. Morgenthau had asked Churchill for permission to also include the text of the then still secret "pastoralization" memorandum signed by Churchill and FDR at Quebec but permission was denied. In November 1945 General Dwight D. Eisenhower, the Military Governor of the U.S. Occupation Zone, approved the distribution of 1000 free copies of the book to American military officials in occupied Germany. Historian Stephen Ambrose draws the conclusion that, despite Eisenhower's later claims that the act was not an endorsement of the Morgenthau plan, Eisenhower both approved of the plan and had previously given Morgenthau at least some of his ideas on how Germany should be treated. Following his resignation, along with other prominent individuals such as the former first lady, Eleanor Roosevelt, Morgenthau remained for several years an active member of the group campaigning for a "harsh peace" for Germany. Morgenthau was first appointed by the U.S. President Franklin Delano Roosevelt as temporary President of the Bretton Woods Conference, which established the Bretton Woods system, the International Monetary Fund and the International Bank for Reconstruction and Development (the World Bank). 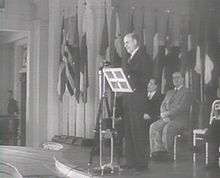 During the inaugural plenary session on July 1, 1944, the Head of the Mexican Delegation, Eduardo Suarez, nominated him as Permanent President of the Conference. This motion was seconded by the Brazilian Head Delegate, Arthur de Souza Costa, and widely supported by several other delegations such as the Canadian and Soviet ones. Morgenthau resigned in mid-1945, when Truman became President and Morgenthau's advice was no longer sought. He devoted the remainder of his life to working with Jewish philanthropies, and also became a financial advisor to Israel. Tal Shahar, an Israeli moshav (agricultural community) near Jerusalem, created in 1948, was named in his honor (Morgenthau (modern spelling Morgentau) means "morning dew" in German, and so does "Tal Shahar" in Hebrew). The 378-foot (115 m) United States Coast Guard Cutter Morgenthau is named in his honor. He was married to Elinor Lehman Fatman, granddaughter of Mayer Lehman, a co-founder of Lehman Brothers; they had three children: Joan Morgenthau Hirschhorn, married to Fred Hirschhorn Jr.; Henry Morgenthau III, and Robert M. Morgenthau. In 1913, Morgenthau purchased a farm in Hopewell Junction, New York, naming it Fishkill Farms. The farm still belongs to the Morgenthau family to this day. ↑ Herman, Arthur. Freedom's Forge: How American Business Produced Victory in World War II, pp. 9–11, 125–7, Random House, New York, NY, 2012. ISBN 978-1-4000-6964-4. ↑ Goldberg, Richard Thayer (1981). The making of Franklin D. Roosevelt: triumph over disability. p. 116. ISBN 978-0-89011-564-0. LCCN 81017555. ↑ John Morton Blum, From the Morgenthau Diaries: Years of Crisis, 1928-1938. Vol. 1 (1959) p 74. ↑ Nasaw, David (September 6, 2001). The Chief: The Life of William Randolph Hearst. 500: Mariner Books. p. 704. ISBN 978-0618154463. ↑ Krugman, Paul (November 8, 2008). "New Deal economics". The New York Times. Retrieved 2012-04-30. ↑ Shlaes 2007, p. 341–342. ↑ Blum, John Morton (1970). Roosevelt and Morgenthau. Boston, Massachusetts: Houghton Mifflin Harcourt. p. 256. LCCN 75096063. OCLC 68158. 1 2 Morgenthau, Henry Jr. (May 9, 1939). Henry Morgenthau Diary, Microfilm Roll #50 (PDF, 1.9 MB). ↑ Morgenthau. "Suggested Post-Surrender Program for Germany". ↑ Gerhard L. Weinberg (2005). Visions of Victory: The Hopes of Eight World War II Leaders. Cambridge University Press. p. 183. 1 2 Chase, John L. (May 1954). "The Development of the Morgenthau Plan Through the Quebec Conference". The Journal of Politics. 16 (2): 324–359. doi:10.2307/2126031. ↑ "The Policy of Hate". Time. October 2, 1944. Retrieved 2012-04-30. ↑ "The Battle for Peace Terms". Time. October 9, 1944. Retrieved 2012-04-30. ↑ "Office of Strategic Services — Official Dispatch, Ref. No. 250". Franklin D. Roosevelt Presidential Library and Museum, Marist College. Retrieved 2012-04-30. ↑ Beschloss 2002, p. 172–173. ↑ Beschloss 2002, p. 233. ↑ "CONFERENCES: Pas de Pagaille!". Time. July 28, 1947. Retrieved 2012-04-30. ↑ Petrov 1967, p. 228–229. ↑ Gareau, Frederick H. (June 1961). "Morgenthau's Plan for Industrial Disarmament in Germany". The Western Political Quarterly. University of Utah. 14 (2): 517–534. doi:10.2307/443604. JSTOR 443604. ↑ Beschloss 2002, p. 250. ↑ Ambrose, Stephen E. (1983). Eisenhower: Soldier, General of the Army, President-Elect (1893–1952). New York: Simon & Schuster. p. 422. ISBN 978-0-671-44069-5. LCCN 83009892. ↑ Casey, Steven (2005). "The campaign to sell a harsh peace for Germany to the American public, 1944–1948" (PDF, 0.4 MB). History. Volume 90, Issue 297, pages 62–92, January 2005. 90 (297): 62–92. doi:10.1111/j.1468-229X.2005.00323.x. ↑ Gunther, John (1950). Roosevelt in Retrospect. Harper & Brothers. p. 102. Wikimedia Commons has media related to Henry Morgenthau Jr..